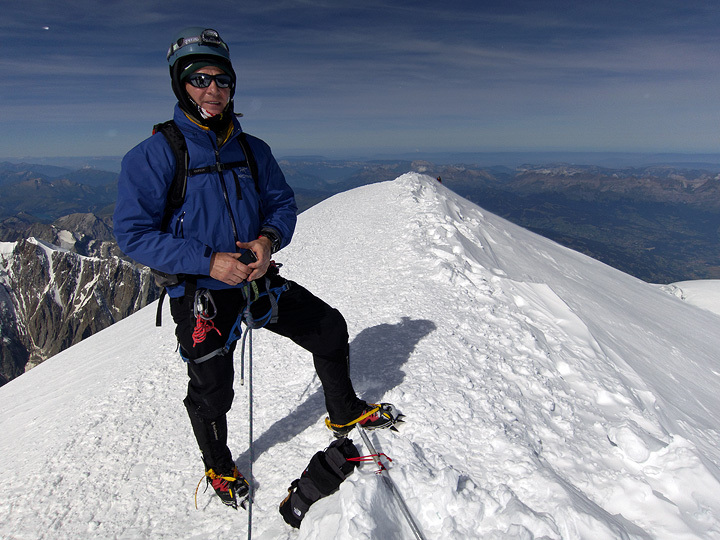 Mike Vrabec came from his home in Wisconsin to have a try at Mont Blanc with Kathy. He picked a good week to come! 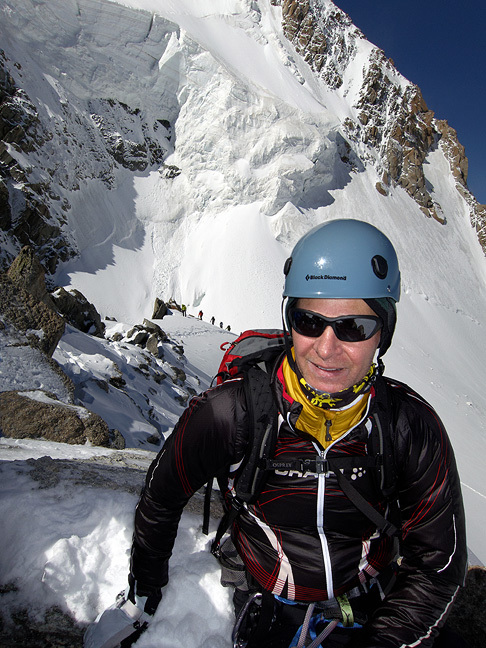 Mike on top of Pointe Lachenal, a warm-up and acclimatization objective. Our week didn't start out so auspiciously however. 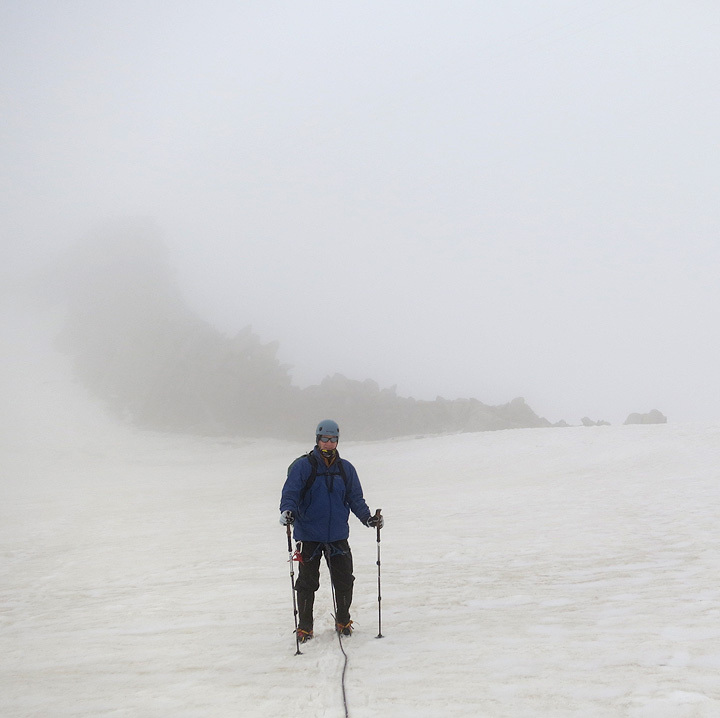 We went up to the Torino hut at Point Helbronner to get started on our acclimatization, but truly horrific squalls prevented us doing more than a brief walk out on the glacier. Mike braces himself as we head back to the barn, soaking wet. By nightfall the skies were clearing, and aside from significant dusting, things looked pretty good. Sure enough, by morning everything was beautiful under clear blue skies. 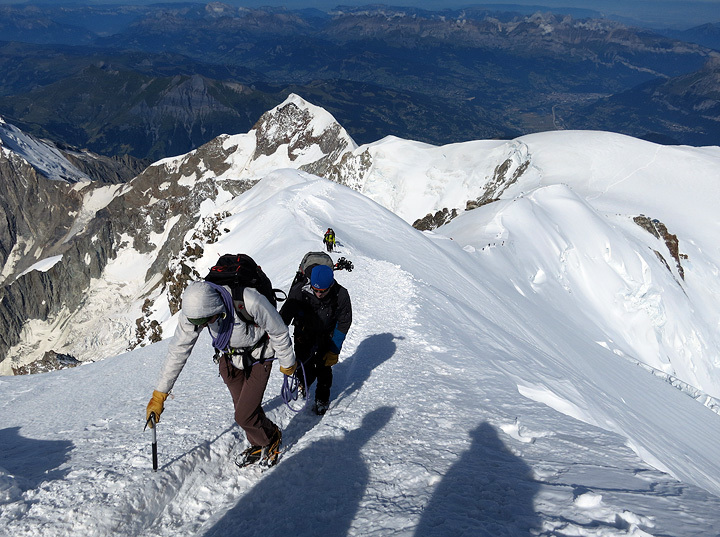 We headed out to cross the Vallée Blanche, back to the Aiguille du Midi. 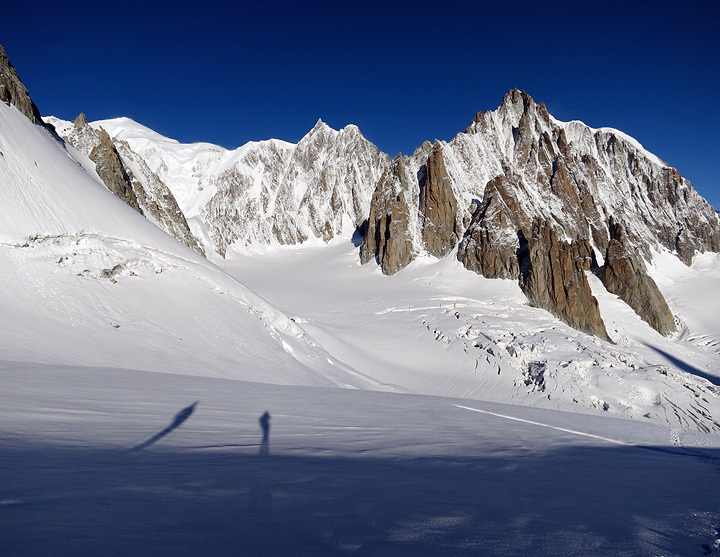 The east faces of Mont Blanc du Tacul and Mont Maudit are the snow-plastered rock faces, the summit of Mont Blanc in the far left distance. 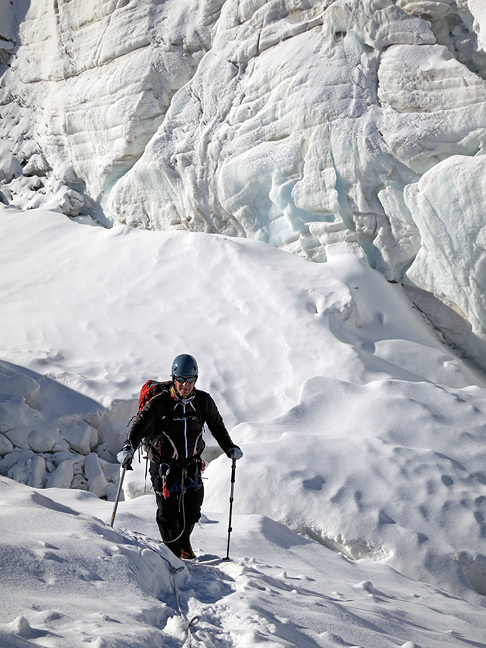 As we entered the heavily crevassed portion of the crossing, the sérac formations were truly impressive. The trail was in pretty good shape for the most part. 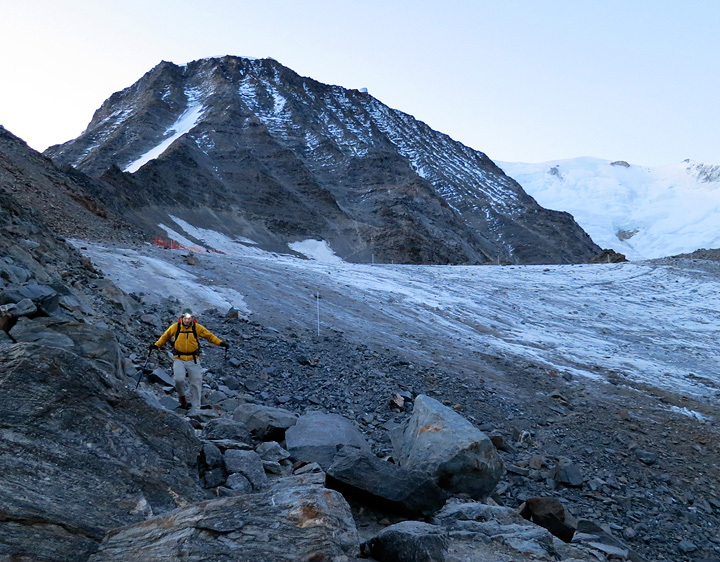 The view back toward Point Helbronner as we get back onto more smooth terrain. 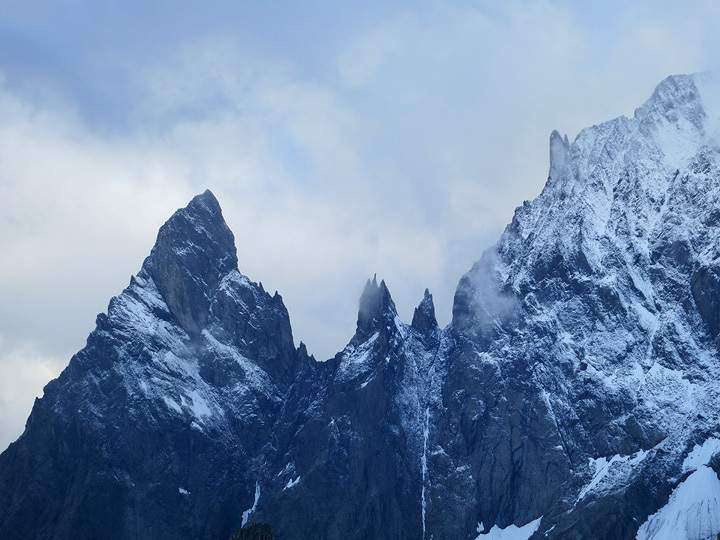 On our way back toward the Aiguille du Midi, we took a side trip up to the top of Pointe Lachenal. 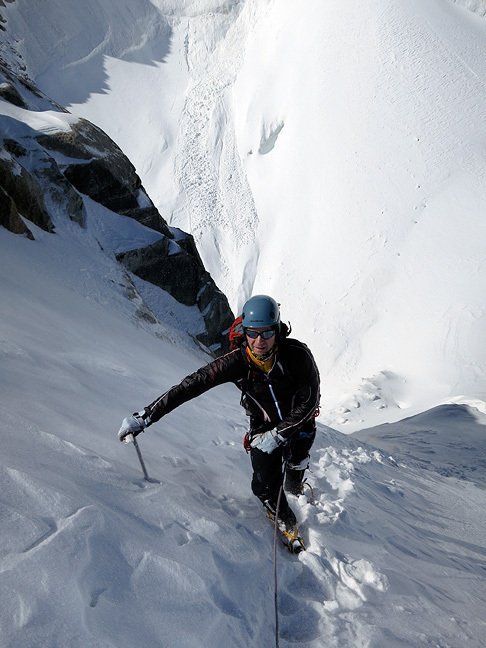 Mike on a steep slope leading to the summit ridge. 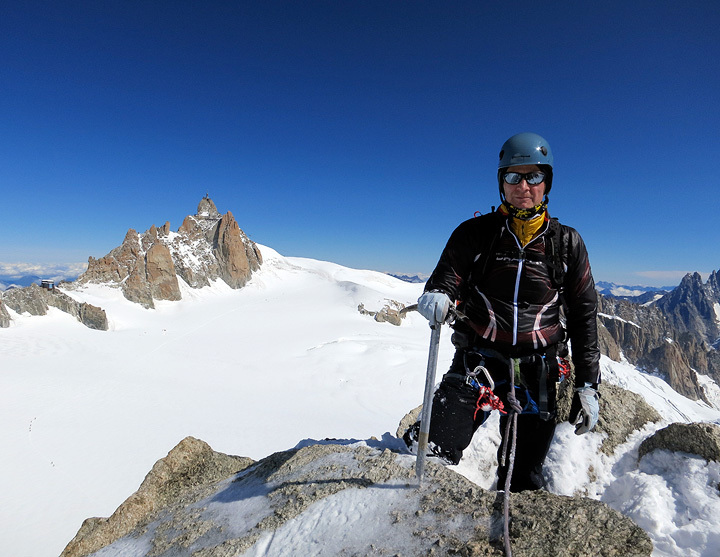 On the summit of Pointe Lachenal, the Aiguille du Midi in the background. 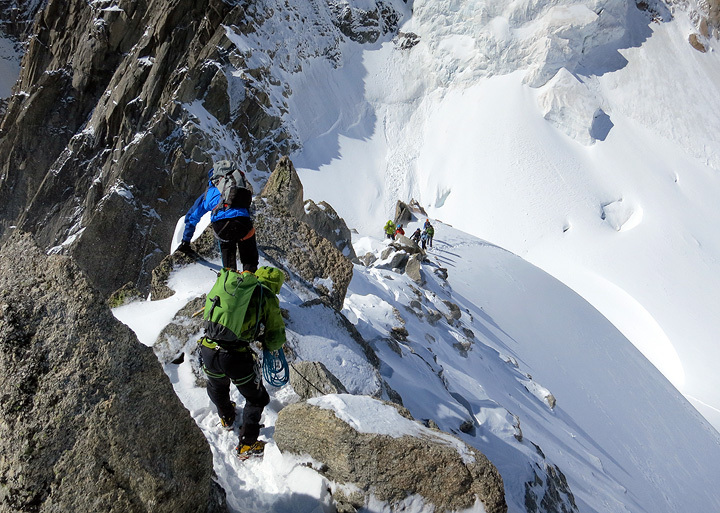 Heading back down the ridge of the Pointe Lachenal. 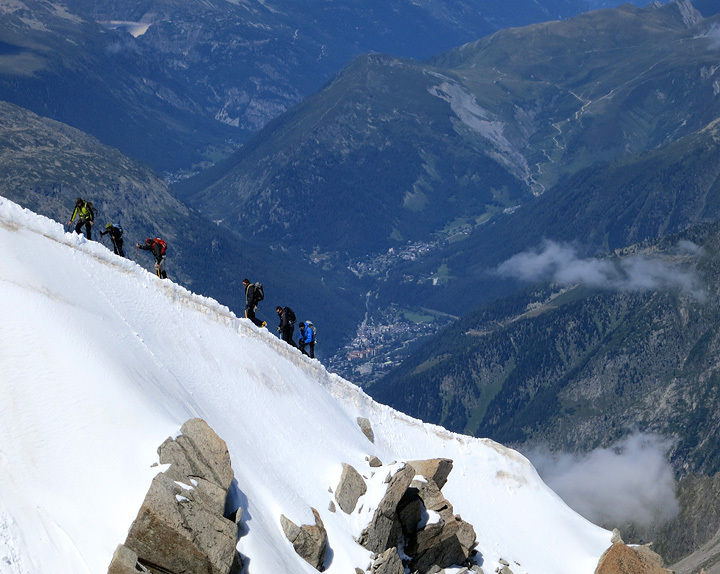 Back up the ridge to the Aiguille du Midi, the villages of Argentière and Montroc in the background. After a night down in town, it's back up to the Tête Rousse hut. 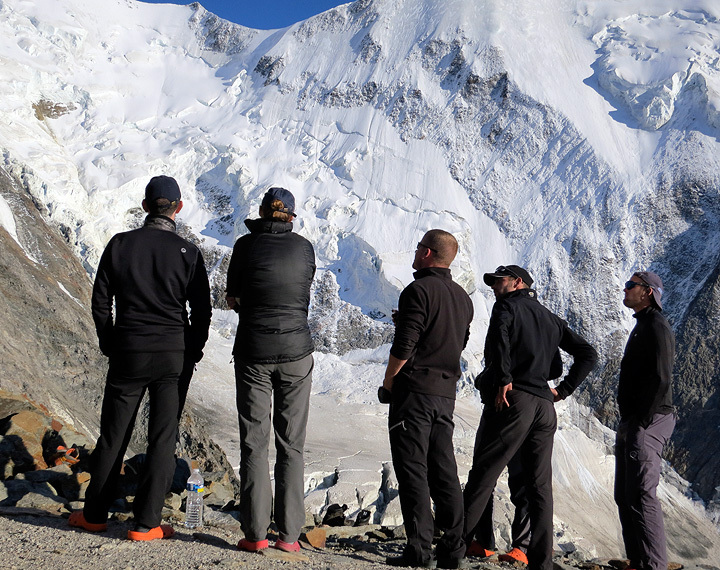 Climbers here checking out the views up the mountain from the terrace. 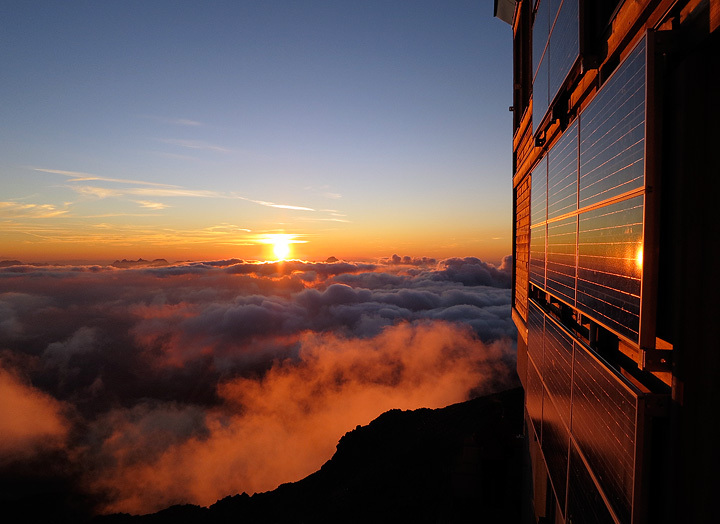 Sunset from the Tête Rousse hut. 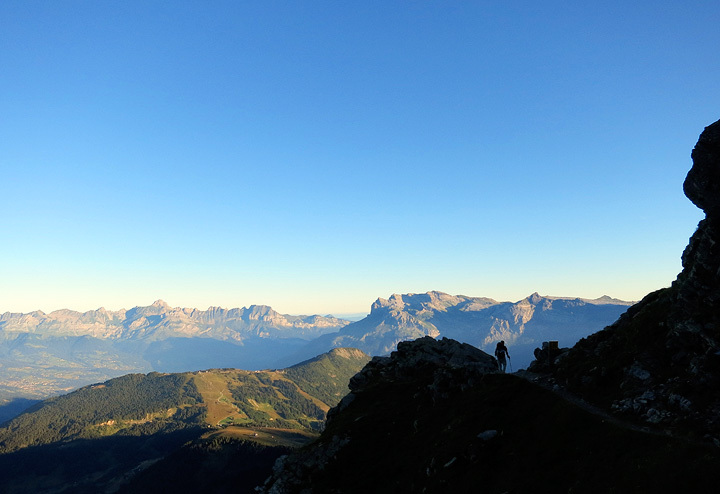 The next morning dawns clear and beautiful from halfway up to the Dôme du Gouter. 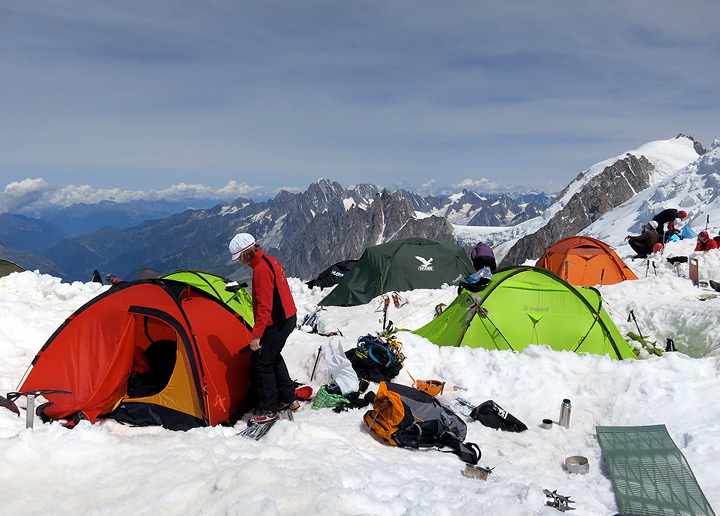 The tent city on the glacier ridge above the Gouter hut. 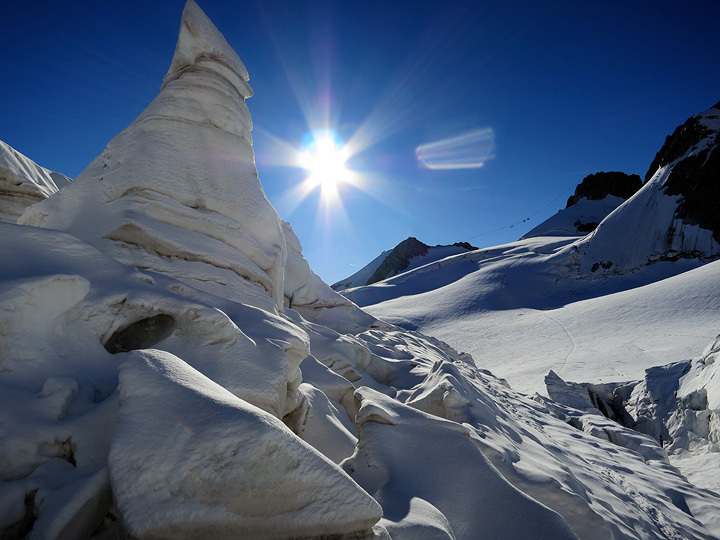 Mont Blanc du Tacul in the right background. Topping out on the Dôme du Gouter we get our first un-obstructed view of the route above. It looks great! Light winds, good track. 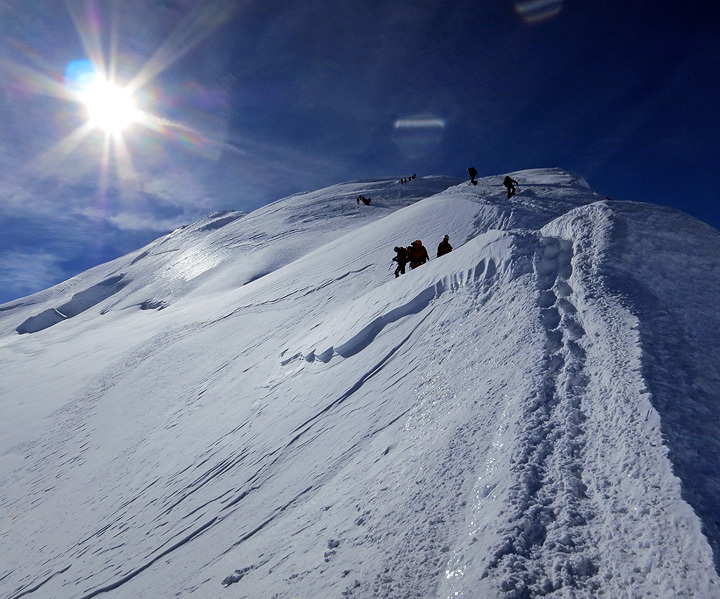 The view up from midway on the "Bosses" ridge. Another party nearing the summit. And we made it! 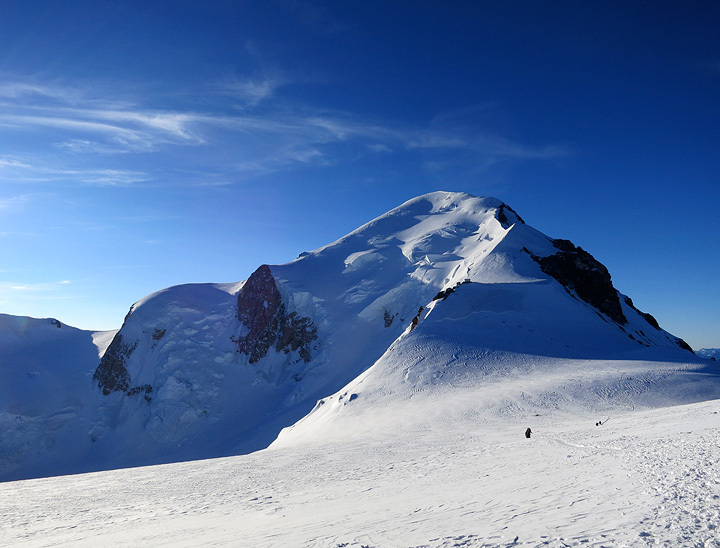 A perfect morning for the summit of Mont Blanc. Of course the top is only half the job done. 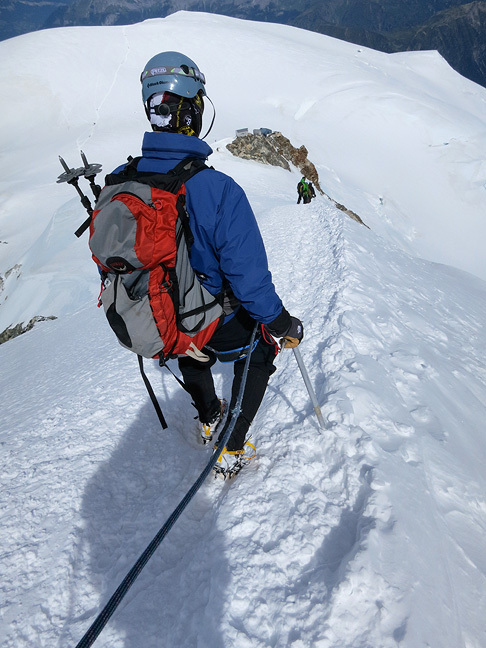 Descending the Bosses ridge, nearing the Vallot hut. 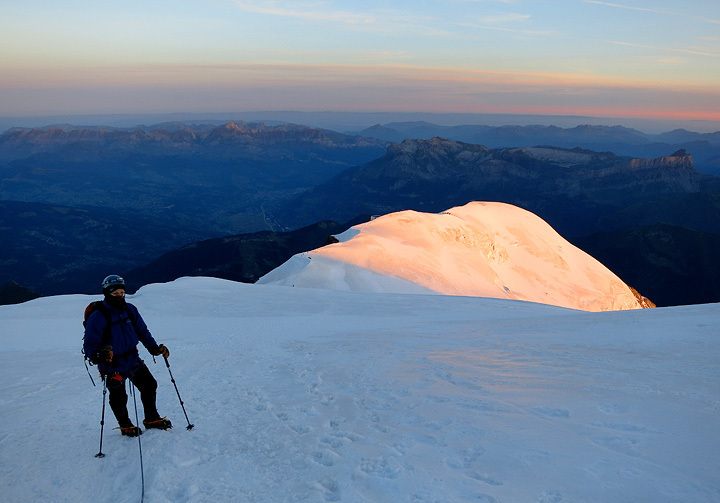 After another night at the Tête Rousse hut, we got an early start to catch the first train down from Mont Lachat. 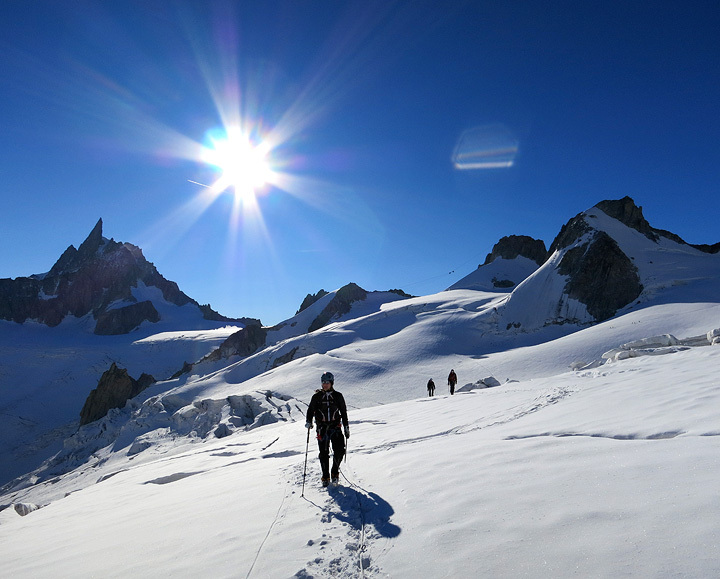 Headlamp start as we cross the Tête Rousse glacier. We descend back toward tree-line and the train, savoring our memory of silence, cold, wind and snow as an antidote to the bustle and heat of this summer's day in the valley.